After about a month of the cold from hell, I thought I might as well jumpstart my blogging habit again with a bit of scandal. Well, it's at least scandal by degrees. Given the limitations set by censors and tradition, Indian song sequences have to work overtime on the metaphor front, and I'm not complaining. After all, who really needs explicit content when you can have the charm of the unseen ... the imagined ... and the forbidden? Inspired by Conversations Over Chai's great post on the same topic, here's my own list of classic Hindi and Bengali songs that explore sensuality, physical affection, and longing. This song marks the point in the film where Madhubala's character finally falls for her soon-to-be-divorced "husband" (Guru Dutt). I don't think Madhubala was ever more alluring than in this scene, in a dark, romantically cut skirt and upturned face, gliding along a balcony under the moon and heavy breeze. And Guru Dutt, casually walking in his rolled-up sleeves out from the shadows of the garden ... Well, it all screams "Gothic romance." (I suppose the de facto abduction supports this reading as well, but don't bother me with the facts.) Yet the overall effect is not of power struggles or helpless heroines or personal manipulation. It's just a hypnotic suspension of time and space and reason, the coming together of two souls who can finally see each other clearly in the moonlight. Possibly the most beautiful Bengali song I've ever heard, it plays a crucial role during this retelling of It Happened One Night. As you probably know, the haughty heiress has to face her own prejudices and her attraction to the working class reporter eventually, and in this version, it is the reporter's ability to shed his middle-class vulgarity and sing (what ho, a working man poet?!) a socially critical piece of poetry that does the trick. 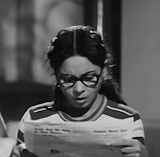 Unlike in Chori Chori's version of the tale (which papers over the classism), the heiress's painful shift from pride to shame to a sort of desperate attraction is documented in Suchitra Sen's face during this song. It's a beautiful knife to the heart. Sharmila Tagore and Soumitro Chatterjee star as misfits thrown together for the day. She's a poor student, he's the listless heir of a rich family. He tries to delay her from the realization that her fiancee is currently getting married to someone else (i.e. someone richer) at his uncle's home, while she works through different stages of grief and anger and abandonment. Eventually, the two head to the harbor in Kolkata, and charter a small boat. She sings heartbreaking rabindra sangeet, and he tries to set his growing interest in her aside to let her mourn. This song makes me laugh if I think about it too much. Uttam Kumar and Supriya Devi are a doctor and nurse, respectively, in a sexless marriage of convenience. Well, convenient for him, at least, as it serves the doctor's ascetic-inspired values of single-minded community service and that other value of yeah, let's have a clean house with a supper on the table. Nurse is way ahead of him, and has to play her cards right to turn her marriage around. In this song, Uttam spends the majority of the shots staring at Supriya with the most comical adolescent look on his face, like, "Hai Ram, you're a girl." Shabash, great diagnosis, doctor sahib. Notable: neither of the protagonists sings the song (it's on the radio), but rather do a sort of complicated dance of avoiding and staring and porch-traversing as they contemplate the straightforward message, "You're my beloved companion." Not sure how I feel about Anil Kapoor starring in a song of sensuality, but lez be honest, Sridevi is almost a couple all to herself in this piece. By the end, she's so worked up she doesn't need much of anyone for a good time. Notable: Let's acknowledge the sheer genius in shooting an intimate scene where the naughtiness is definitely happening right before everyone's eyes, yet is still completely inaccessible to the censors. Note on my choices: For the most part, I tried to pick sequences that were absent from other people's "sexiest thing evah" lists. Everyone has beaten the Anamika, Fakira, Kabhi Kabhie, Sharmilee, and Blackmail horses to death (which explains the dearth of 70s films on the list), so those were out. The songs above all involve potential couples, which removed songs of solo longing; eliminated the odd genre of domestic voyeurism songs, such as this one from Abhinetri, or this one from Manoranjan (which make me uncomfortable anyway, as my American horror film upbringing always tells me that someone is about to be murdered at the end of these songs); and also disqualified vamp seductions and item songs. I realize now that most of my picks either fall into the "unintentionally funny" or "finally emerges from long-held prejudice" categories, but that seems quite like life, so I won't mess with a good thing. Let me know what funny or socially conscious sensual songs you would have picked in the comments!